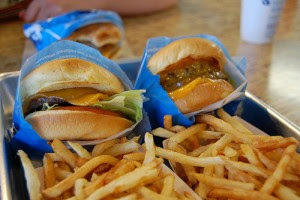 I've heard whispers that Elevation Burger, a burger hot spot that just recently opened on 14th between 6th and 7th, is the "new Shake Shack." Since we all know the Shack is delicious, this place has gotta be good. To sweeten the savory, today and all weekend Signpost.com is offering a special deal so you can experience Elevation on the cheap before you fully commit your future burger dollars: $5 for 2 burgers! For 5 simoleons, I'm in.